You'll be £8.99 closer to your next £10.00 credit when you purchase Midget Ninja and Tactical Laxatives. What's this? 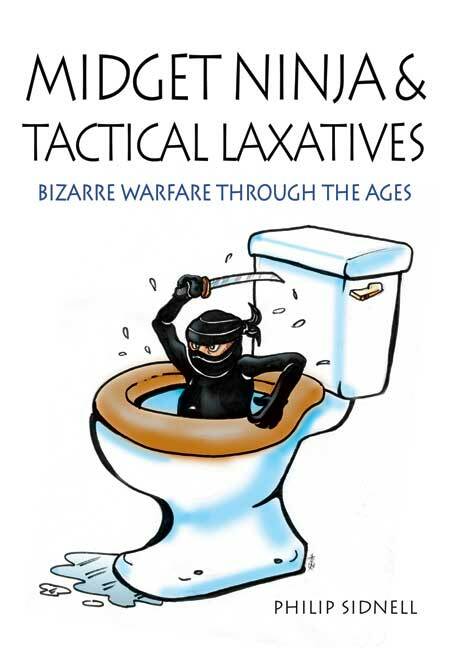 Midget Ninja and Tactical Laxatives is a light-hearted look at some of the most bizarre incidents, weirdest weapons and strangest stratagems to be found in the annals of warfare. Drawn from all periods of history there is something here for every reader with an interest in military history and/or a sense of humour. … the tone is about right, with the right mix of amused surprise and clear explanation. There are also a set of useful footnotes that provide the original sources for most of the stories. I must admit some of the incidents described were quite familiar to me (the many wounds of Alexander the Great or some of the more unusual ways in which warships sank themselves), but given that I spent most of my time reading a wide range of works on military history I was surprised just how many of the topics were entirely new to me. There are plenty of interesting snippets in here, with enough variety to ensure that any familiar story is followed by something new and unfamiliar. The author writes in an engaging, amusing, even ‘matey’ style, which suits the content, as if it were stories being exchanged in your local pub or down the wargames club. The chapters are divided into brief anecdotes, some barely more than a paragraph, a few page or two long. Sidnell’s expertise in the ancient era is clear and where he seems most comfortable, but he has managed to unearth plenty of unusual and extraordinary facts from the full breadth of military history, whether it be idiots who met uncomfortable ends, bonkers inventions, breathtaking incompetence or simply exploits that just leave you wondering what the participants must have been thinking. An irreverent look at some unusual stories and extremely odd tactics which have been employed in war from ancient times to the modern era. They range from the brilliant, albeit unusual, to the tragically misguided and the plain surreal. Included is the proposal to bomb Japanese cities using bats laden with incendiary devices, a plot to assassinate senior German officers using a juggler whose skittles were packed with explosives, the use of an enormous man-made iceberg as a floating airfield, and an attempt to commit suicide through poison by a man who had devoted much of his life to building up an immunity to poisons. This excellent book will certainly make an entertaining gift for anyone who has an interest in military history and a dry sense of humour. America planned to explore a nuclear bomb on the moon to scare Cold War rival Russia, according to newly released secret papers. But as a new book reveals, history is littered with madcap military moments. When the Germans invaded in 1941, the Russians enlisted their secret weapon – Nina The Juggler. The Moscow circus performer was ordered to entertain enemy troops – then lob her skittles, pre-packed with explosives, at them. It would have gone with a bang if the Nazis had not already been halted on the city’s outskirts. Philip Sidnell has a First Class degree in War Studies and History from King's College London and was for some years the Editor of The Military and Aviation Book Society, Ancient and Medieval History Book Club and the History Guild. He is now a commissioning editor for Pen & Sword Books, one of the UK's leading specialist publishers of military history. He edited Tribute: the Combat Experiences of the Military and Aviation Book Club, and wrote Warhorse: Cavalry in Ancient Warfare. A keen wargamer, he has a deep interest in all periods of military history but a special fondness for the ancient world. He lives and works in Kent.